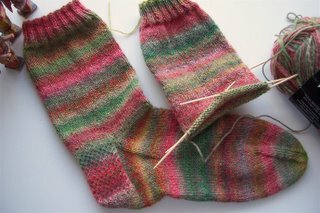 I’m designating Amie as my Jaywalker Pinch-Knitter. Why should I bring the whole team down, when she’s obviously going to finish her pair? I’ve moved on to this simple, uncomplicated pair, since it’s clear that I can’t jaywalk properly. They remind me of geraniums in the summertime, which makes me happy. Don’t Olympians have trainers and coaches who tell them what to do? J and I tell each other what to do all the time. We’re in consultation at this very moment. All is not lost, and it is a particularly beautiful day today, so I think I will spend time enjoying it! very pretty socks. Perhaps you are alot like yarn-a-go-go. She loves the look of lacey socks.. but likes to knit plain st st b’c that is what she LIKES. *shrug.But I like both the socks and the discourse on the sweater. Keep thinking out loud.. it will come. Well — personally I like the first sweater and have total faith that you can change the neckline to something you love. I love that color of Trekking!